ADELAIDE'S reserves will wear a traditional 'V' guernsey next season, with almost 5000 club members voting for it after being asked to choose from six designs. The jumper claimed 36.59 per cent of the total vote. 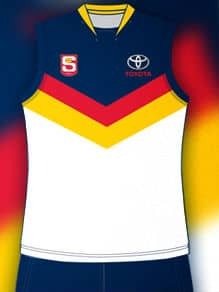 All six designs had a white base to avoid clashing with existing SANFL jumpers. Crows chief operating officer Nigel Smart said the fans' choice echoed his own. “The more I looked at [design] C, the more I thought it suited what we need for the SANFL competition, and that’s what a clear majority of the fans [thought]," Smart said. “It was good to involve the fans in submitting the initial ideas and designs and creating some debate around the guernsey and our SANFL team. “We didn’t want to need to create another clash strip and the SANFL was also keen for us to have a different look to the other teams, so the white base worked in that sense.